My grandfather Harry Peck founded an advertising agency in New York City in 1922. This was unusual for several reasons. Advertising agencies were not very common at the time. And agencies founded by Jews was almost unheard of. 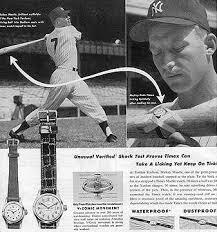 My grandfather’s advertising and branding claim to fame was the work he did for Timex watches. Who can forget the Timex torture test campaign where the brand’s durability, shock resistance and waterproof benefits were demonstrated using dramatic executions (as we call them in the ad biz). The campaign went on for years. It takes a lickin’ and keeps on tickin’. My grandfather sold his agency when I was young, but he lived to see my wife and me start our own advertising agency in New York City. What he did for Timex proved to be a model for the best work I’ve done in my marketing career. Here are 6 things I learned from him. Have a great selling idea. Keep your campaign going strong for as long as possible. My grandfather passed away many years ago. His take on branding lives on.